Joy Home for Children is Registered Charity which offers a home for Orphan Children in Hyderabad, India. Joy Home for Children is located in a village called Madhapur, Nalgonda District which is about 40 km's South East from Central Hyderabad, India and was founded in 2004. 'Joy Home provides a safe and secure environment for orphaned children'. There are up to 100 children we support including local villiage children as well as a nearby HIV center (outreach project). ‘Joy Home for Children’. These children are not for adoption and will remain part of the Joy Home family. From 2004 till 2008, Joy Home for Children was privately funded by founder Dr. Nirmala Jyothi, her husband Dr. K. Karunakara Rao and their family and friends. As the number of orphaned children increased and with spiralling costs, it became essential to generate extra funding to provide the long term security for the children. In March 2009, Joy Home website was launched followed by British Registration in August 2009. Now Joy Home for Children Orphanage is now offering everyone the opportunity to make a real difference. We have 3 acres of land with plenty of space for development. Once developed, the land will provide an income as well as fresh fruit and vegetables for the home. 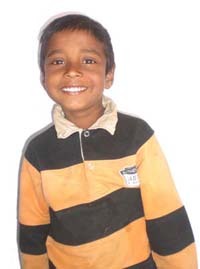 From our needs list you can choose what you would like to fund for the orphan children in India. You can make a donation online and we will tell you exactly where your money has been spent as well as providing regular updates via our website. As a small charity, it is so much easier to relate back to those that help. Joy Home for Children Orphanage is non profit making; all donations received (after bank fees) are spent on the orphan children in India. There are no UK salaries, no administration costs and no marketing budget. We do not spend donations on TV advertising or magazine campaigns. We are in search for corporate sponsorship to cover running expenses. Currently, our website is the only marketing tool which is created in-house for free. We rely on you as a website vistor to let others know about Joy Home for Children Orphanage. Very Kind Donation = £30.00 from Mr/Mrs. Valluripal & £300.00 from Mr. D.
£116.92 From Naveen T & £132.69 via Paypal. £100.00 Thank you Mr & Mrs. B. Other Paypal Donations Total = £72.80. 3 Paypal Direct Debit Supporters Sangha. Ian & Ruth. No fund raising events as yet. Joy Home looking for fund raisers/donations for disabled children in India. Joy Home Orphanage receives British Registration Status by Charity Commission. Joy Home Orphanage hit by storm force winds destroying the roof - May 2009. Charity Web site lauched - March 2009. Thank you to our 3 direct debit supporters Sangha. Ian & Ruth. Leaving a Legacy to Charity - Fund Raising for Orphan Children in India - Donate to Charities - Contact Joy Home for Children - ASR Search Engine .